Anytime I’ve invested in something that made the word “Blast” a core selling point, has never turned out well for me. 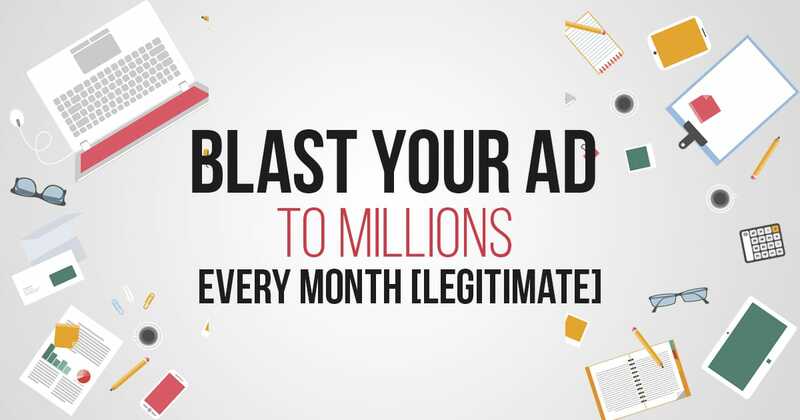 So you could say I’m a bit skeptical about programs that promise to blast a solo ad to one million people. 1) Where did these millions of people come from? It can take years of promoting to develop a list with over one million people. So before I go blasting them, I’d like to know a little background history. A) Did they voluntarily optin to this list? B) What enticed them to join this list? C) How many of the emails on the list are stale? 2) Who wants to receive HUNDREDS of email promotions daily? I can’t stand seeing my inbox loaded with SPAM mail. There are times I’ve sacrificed many hours out of my day just to unsubscribe from email lists. In saying that, I’m a bit hesitant to use an email blasting service that’s available for any person promoting a product. For instance, a popular solo ad service Blast4Traffic pitches that their system will allow anyone using it to blast up to 2.3 million emails every day. Assuming they have over 100 promoters using the services, that means the people on the list could very well receive over 100 promotional emails on a daily basis. That’s if they ONLY have 100 promoters. There could be many more! Even if the people on the list love receiving email promotions, with that many being sent, your email message could easily be smothered out by all of the others. After checking out reviews from people who have used services like Blast4Traffic to blast ad to millions every month, I learned that they experienced ZERO if any results. Confirming my negative concerns about “solo ad email blasting”. Systems like that will charge an extremely low price for a supposedly unrealistic product. Any list manager with one million people on it would never allow strangers to send promotional emails endlessly if the list had real value. In fact, if the list was legitimate, they would protect it with their life and make money sending their own promotions; OR they would charge a higher rate for a smaller list count. Does sending a solo ad to one million people for less than a dollar sound like a good deal or a “crappy product” to you? From here on out, I suggest never considering solo ad systems that pitch “Blasting”. You’ll have better results just throwing your money in the streets to get leads. Now if you want your email promotions to get conversions, leads and sells, then you need a solo ad provider with a real legitimate list. Udimi is a directory site with hundreds of professional list mangers who’ll send your solo ad to a high quality, high converting list. What I like most about Udimi is that you can read the lost managers reviews from previous solo ad buyers. Which means list managers better have a list that converts or the truth will eventually surface. Conclusion: Ditch anything that pitches “blasting” and make an investment to buy high converting email database services from legitimate solo ad providers like Udimi. ← The ONLY Legitimate Email Processing System – FREE Training!